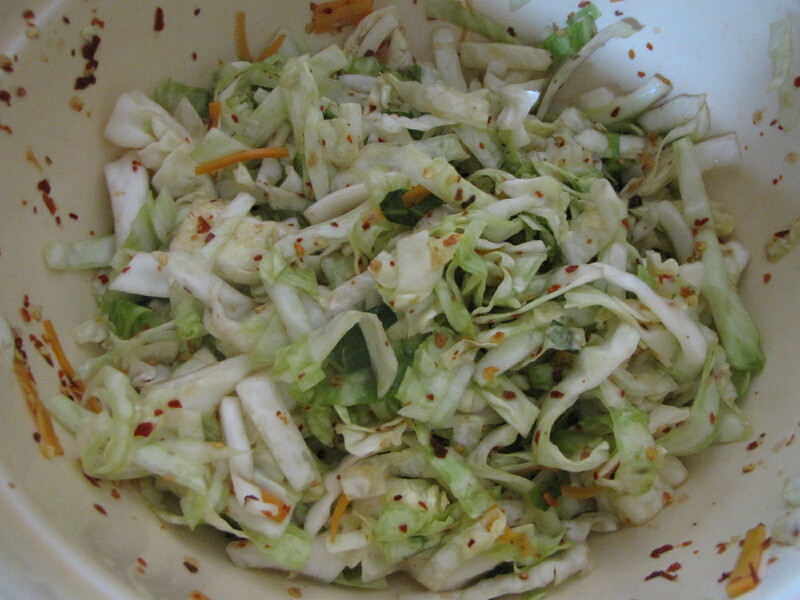 A few years ago I discovered kimchi, a spicy fermented cabbage, that’s a staple in Korean cuisine . 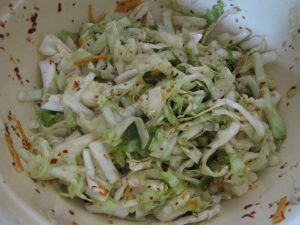 It’s typically made with napa cabbage but since I’ve got a lot of green cabbage growing in the garden, I decided to try making it with what I had on hand. 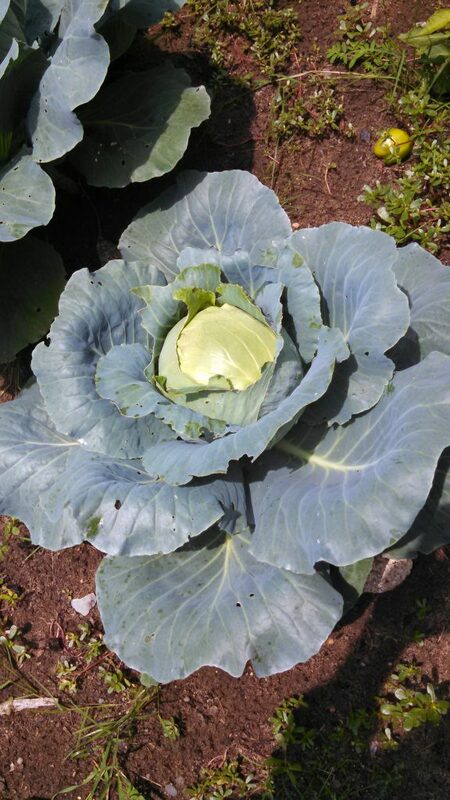 A beautiful head of cabbage ready to be made into kimchi. Spoiler alert: I was not happy with how it turned out BUT I think I know what I did wrong and am going to give it another try. 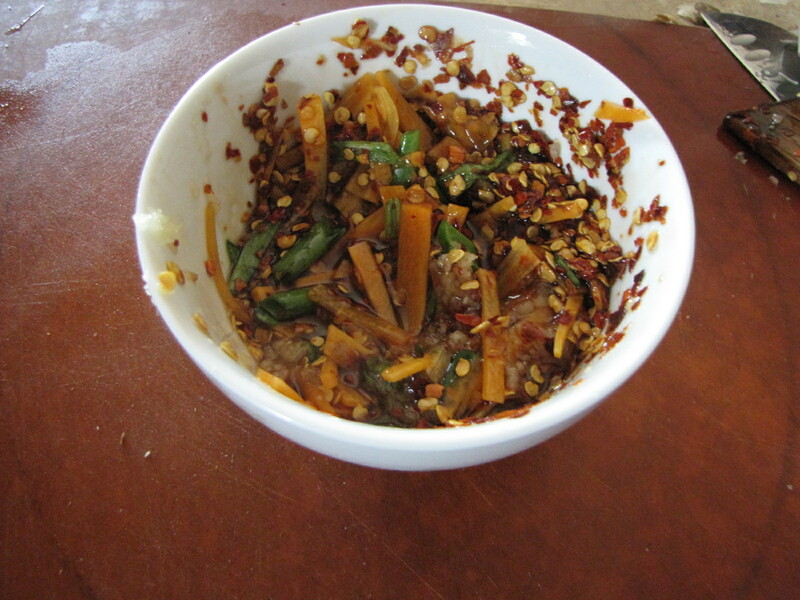 My recipe inspiration came from Maangchi who provides a very simple recipe for Emergency Kimchi. I followed her process but changed the recipe (of couse!). It was excellent BEFORE it fermented. Then it ended up tasting like soap. Weird. So, much to my chagrin, I had to toss the batch. I’ve decided that next time I’m going to let the cabbage sit in the salt water for an hour – not 10 minutes. I’ve also decided to add a tablespoon or two of water to the paste. I’ll update this post to let you know how it turns out the second time around. If you have any suggestions, please leave a comment below. 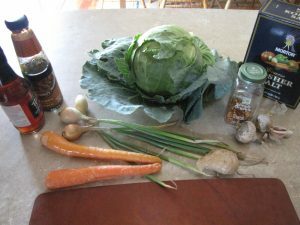 All the ingredients – cabbage, kosher salt, hot pepper flakes, sugar, fish sauce, oyster sauce, green onion, garlic, ginger and julienned carrot. 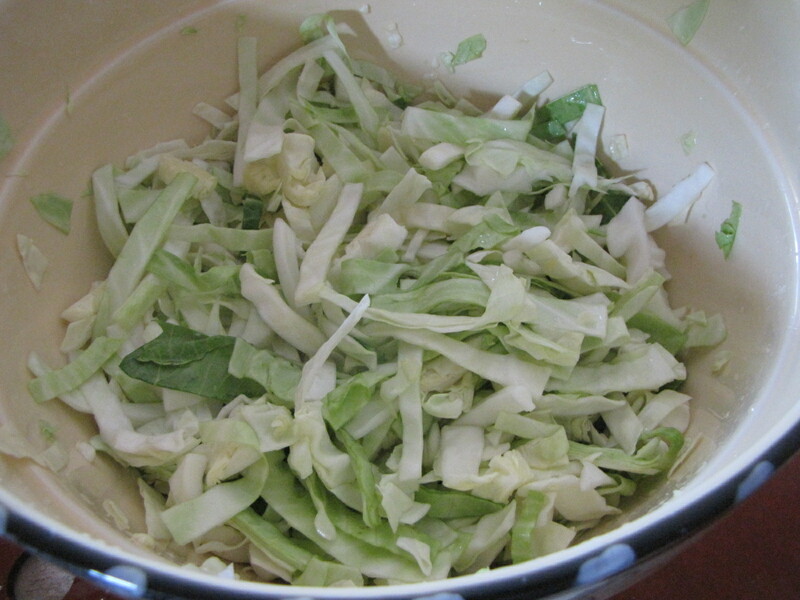 Cut the cabbage into 3″-4″ lengths that are about 1/4″-1/2″ wide. Let sit in salt water for up to an hour. Rinse. In the meantime, combine 1/4 cup hot pepper flakes, 1 tablespoon sugar, 1/4 cup fish sauce, 1 tablespoon oyster sauce, 1 tablespoon grated ginger, 1 medium carrot julienned, 2 tablespoons water and 1/4 cup chopped garlic. Combine paste with rinsed cabbage. If you want, you can eat this right away. It tastes great! Now here’s where I would do things differently. I left the kimchi in a plastic bag. Next time I plan on following the tips in the post Hot and Healthy: How to Make Better Kimchi at Home on the Greatist blog. The tip is to ferment in mason jars. This should take 3-5 days. I promise to keep you posted . . .